For our final foray of the season, eight members of the group met in the Forestry Commission carpark for a blustery foray. 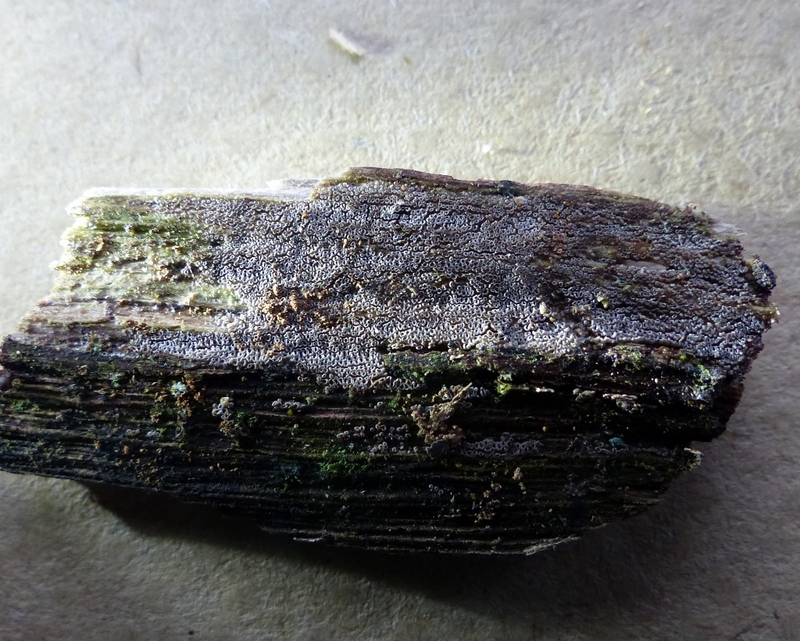 At first, we struggled to find much but gradually we started seeing more, particularly smaller fungi and resupinate fungi, which form a crust on dead wood. Eventually we found and were able to identify 34 species. Resupinate fungi that we found, and were able to identify, included Radulomyces molaris (left) waxy with soft, irregular spines, and Radulomyces confluens (right) with a rough, lumpy surface and a smell somewhat reminiscent of phenol, but ID confirmed by microscopy. We also found things we couldn’t name, amongst them a single specimen of a little toadstool with a distinctive lilac cap and small spores, 2u across (left below) and what we thought was a crust with a fine reticulate pattern which, on closer examination, proved to be a dense cluster of cups (right below). 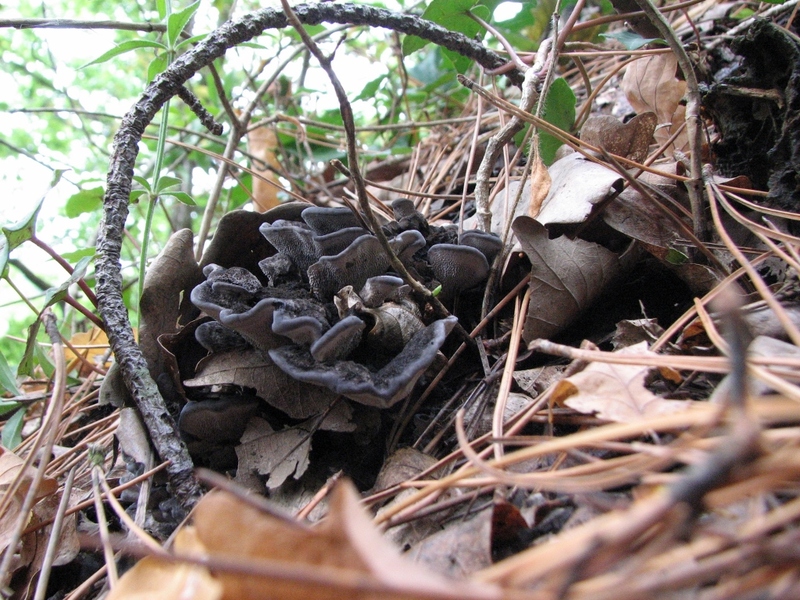 If you click on he picture you will see the apothecia. Natalie found this one. 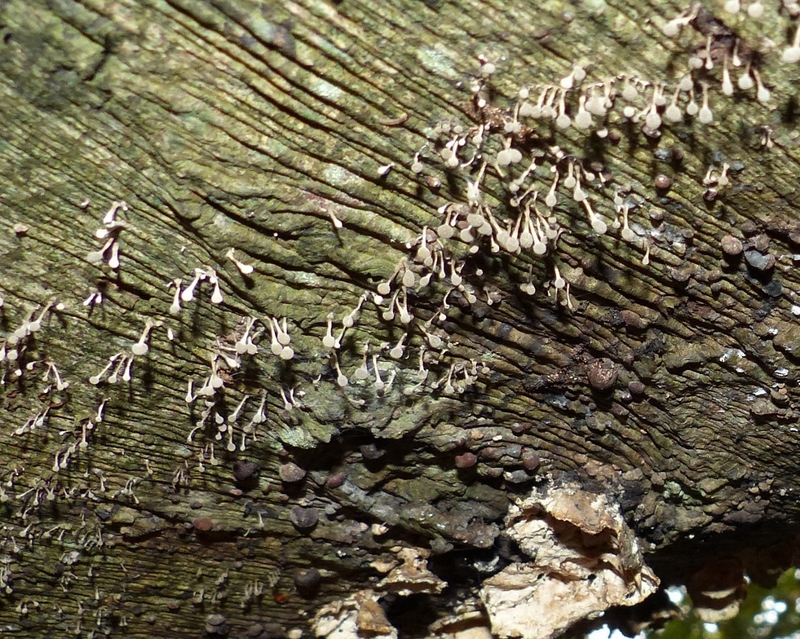 It might be a Mollisia sp. but surprisingly didn’t have any ripe spores. The foray finished with a nice group of white saddles, Helvella crispa, found by Jillie in the carpark. The weekend had turned cold and so eleven hardy souls we were wrapped up well for our foray. Despite being late in the season, we did well. It was an enjoyable walk and we recorded 30 species. 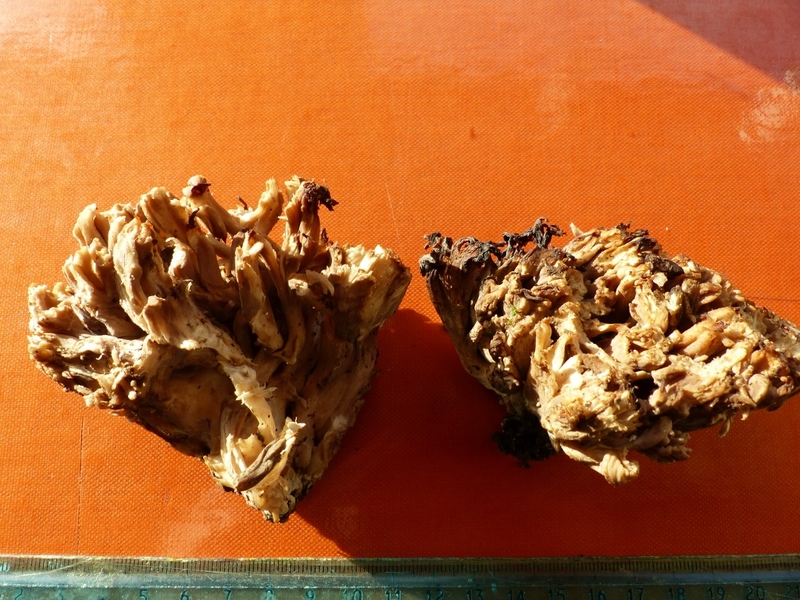 The first thing we found, near the carpark, was an old moribund specimen of a Cauliflower Fungus. 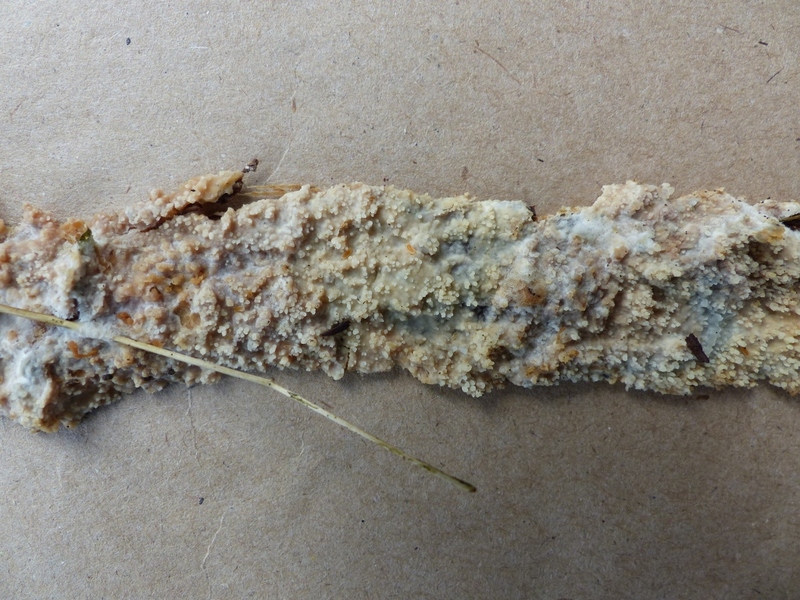 There were no conifers in the vicinity and microscopy confirmed that this was a Sparassis so we determined this as the uncommon Sparassis lacunosa. We then ventured down the Devil’s Chimney into the Landslip proper finding some fine Jew’s Ear or Jelly Ear fungus, Auricularia auricular-judae, (left below) and a spectacular young growth of Blushing Rosette, Abortiporus biennis, covered with coloured droplet of exuded water (right below). 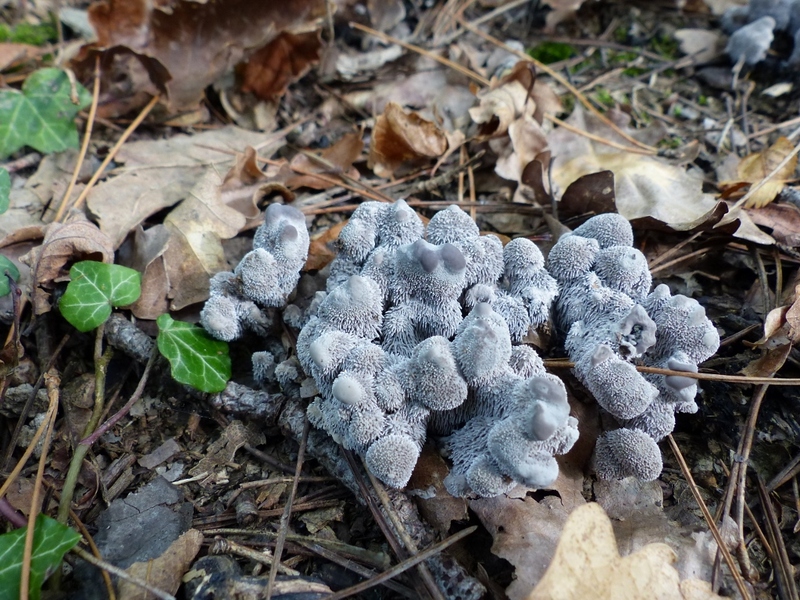 Candle snuff, Xylaria hypoxylon, caught our attention because of its very thin fruiting bodies (left below) whilst Brick Tuft, Hypholoma lateritium made a colourful show (right below) and was a nice change from the commoner Sulphur Tuft, which we also saw. One of the more unusual species we recorded was Hydropus floccipes. 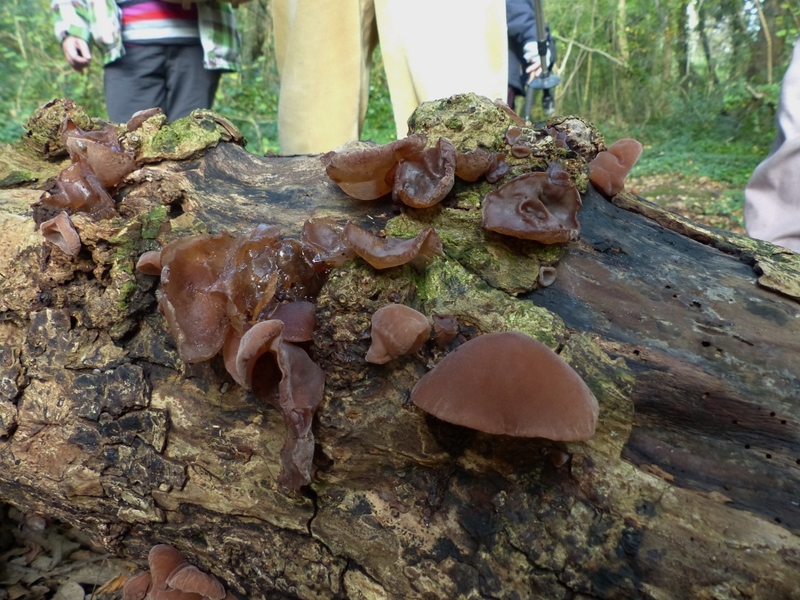 Additional species recorded were: Purple jelly disc, Ascocoryne sarcoides; Wood Woolly-foot, Collybia peronata; Peeling Oysterling Crepidotus mollis; Cramp Balls, Daldinia concentrica; Exidea nucleata; Southern Bracket, Ganoderma australe; Dewdrop Bonnet, Hemimycena tortuosa; Blackening Waxcap, Hygrocybe conica; Snowy Waxcap, H. virginea; Beech Woodwart, Hypoxylon fragiforme; Hazel Woodwart, H. fuscum; Lilac Fibrecap, Inocybe lilacina; Common Cavalier, Melanoleuca polioleuca; Clustered Bonnet, Mollisia cinerea; Mycena inclinata; Mycena adscendens; Snapping Bonnet, M. vitilis; Oak Curtain Crust, Hymenochaete rubiginosa; Phoma hedericola; Bitter Bracket Positia stiptica; Blueing Bracket P. subcaesia; Tar Spot, Rhytisma acerinum; Split Porecrust, Schizopora paradoxa; Hairy Curtain Crust, Stereum hirsutum; Turkeytail, Trametes versicolor; Dark scaled Knight, Tricholoma atrosquamosum. 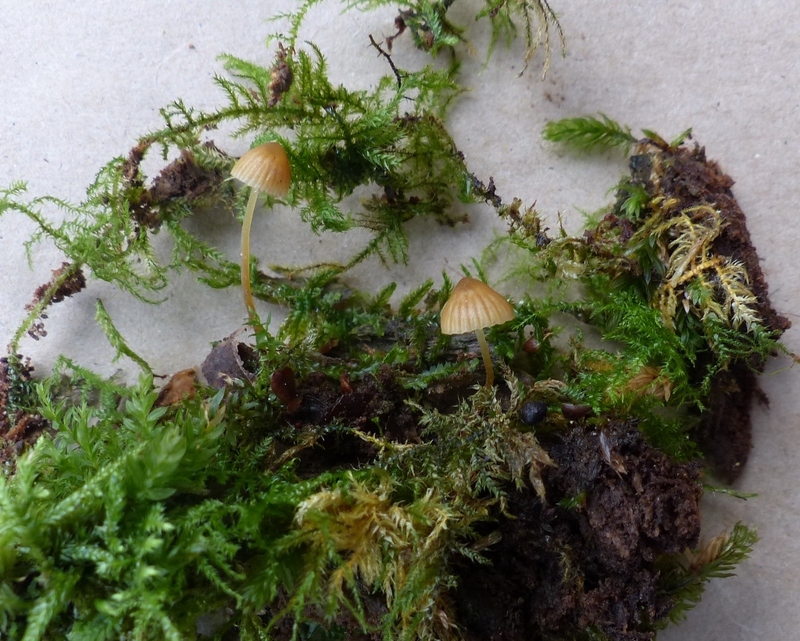 Despite the continuing damp and mild weather, the woodland fungal flora sees to be flagging. 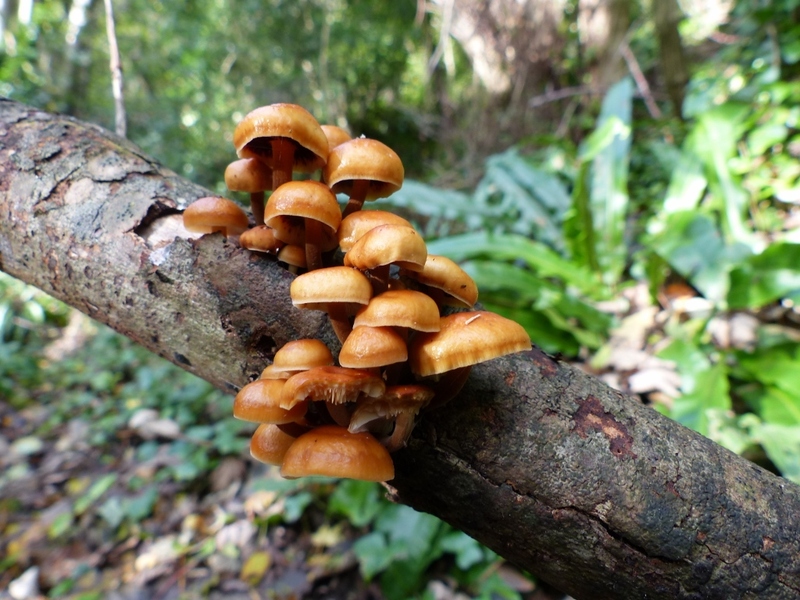 We had an enjoyable morning with some interesting finds but fungi were notably fewer in both numbers and species. Nevertheless, we were still able to record 50 species. Interesting finds included: some well developed powdery pick-a-back fungus (Asterophora lycoperdioides) growing on old fruit bodies of the blackening russula; the delightful little Mycena epipterygia with yellow stem and easily removed viscid cuticle; a spectacular show of the mauve resupinate fungus which causes silverleaf on plums growing unusually on a fallen pine; and plenty of hedgehog fungi. The following species were recorded: Agaricus silvaticus (Blushing wood mushroom); Agaricus silvicola (Wood mushroom); Amanita citrina (False Death cap); Amanita excels var spissa (Grey spotted amanita); Armillaria gallica (Bulbous honey fungus); Asterophora lycoperdoides (Powdery piggyback); Bjerkandera adusta (Smoky Bracket); Calocybe carnea (Pink domecap); Claviceps purpurea (Ergot); Chondrospermum purpureum (Silverleaf); Clitocybe nebularis (Clouded agaric); Collybia butyracea (Buttercap); Crepidotus variabilis (Variable oysterling); Erysiphe adunca; Erysiphe alphitoides; Flammulina velutipes (Velvet shank); Helvella crispa (White saddle); Hydnum repandum (Wood hedgehog); Hygrophoropsis aurantiaca (False chanterelle) Hypholoma fasiculare (Sulphur tuft); Leccinum scabrum (Brown birch bolete); Lepista nuda (Wood blewit); Leptotrochila ranunculi; Lycoperdon perlatum (Common puffball); Lycoperdon pyriforme (Stump puffball); Mycena adscendens; Mycena epipterigia (Yellowleg bonnet); Mycena vitilis (Snapping bonnet); Phlebia tremulosa (Jelly rot); Phragmidium violaceum; Physisporinus sanguinolentus (Bleeding porecrust); Pluteus cervinus (Deer shield); Postia stiptica (Bitter bracket); Psathyrella piluliformis (Common stump brittlestem); Pseudoclitocybe cyathiformis (The Goblet); Puccinia caricina var. ribesli-pendula; Ramularia succisae; Rhopographus filicinus; Rhytisma acerinum; Ricknella fibula (Orange mosscap); Russula nigricans (Blackening britllegill); Sawadaea bicornis; Scleroderma citrinum (Common earthball); Septoria epilobi; Stereum gausapatum (Bleeding Oak Crust); Stereum hirsutum (Hairy oak curtain); Stereum ramale; Taphrina caerulescens; Tricholoma ustale (Burnt knight); Xylaria hypoxylon (Candle snuff). 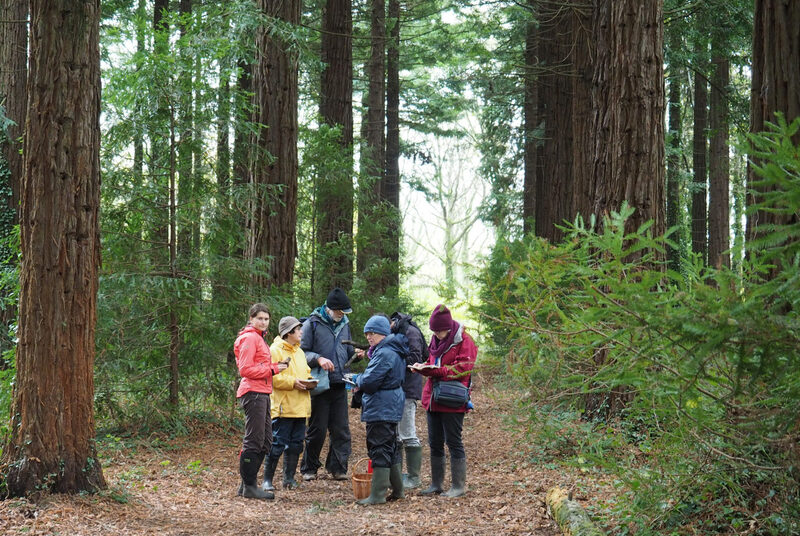 For the first time ever, our group were in completion with another fungus foray, being organised through the Autumn Walks Festival! However, ours started an hour earlier, so we were first on the ground! The weather had been dry for a long period so we were not optimistic about finding much; in the end, we did surprisingly well, recording 60 species. Quite a few of these were associated with old wood, something of a feature of Borthwood. 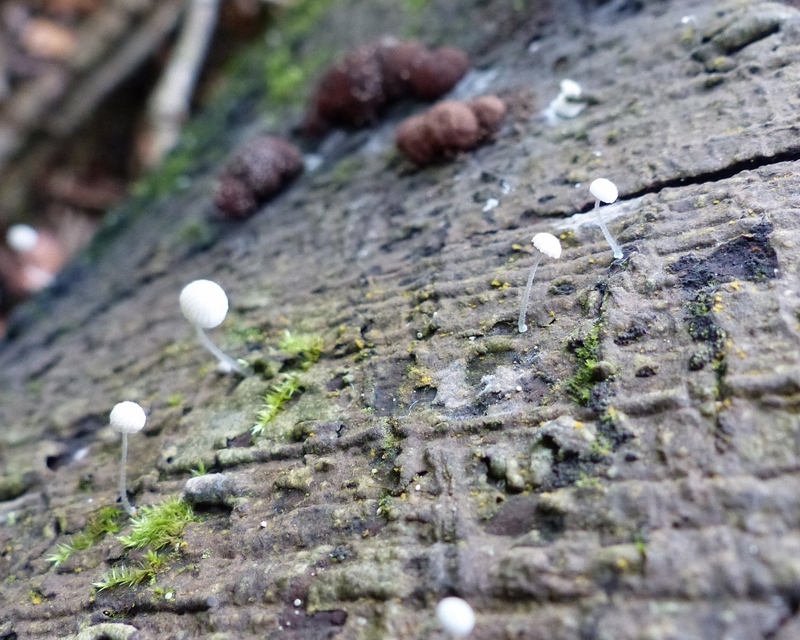 One interesting but tiny fungus we found on an old dead oak trunk was Mycena clavularis, characterised by a bulbous base to the stipe. 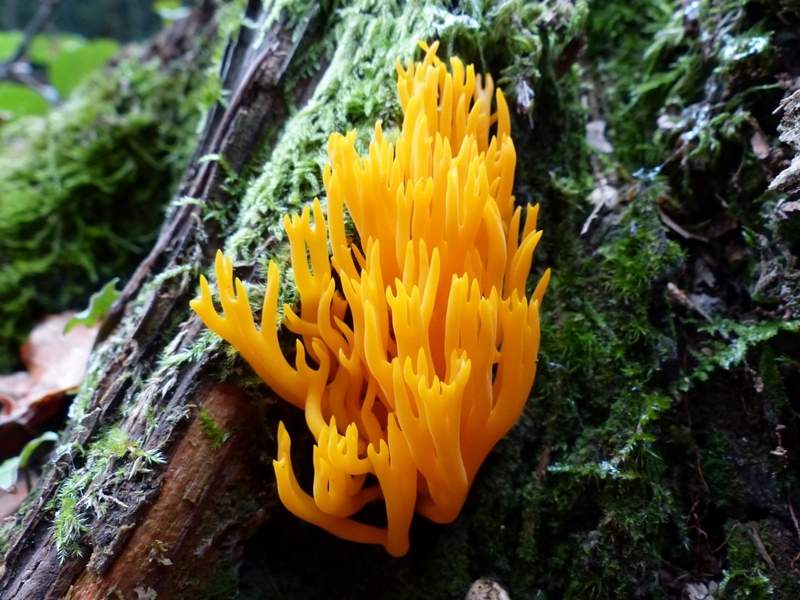 Commoner but much more showy, and attracting those of us with cameras, was the Yellow Stagshorn, Calocera viscosa. 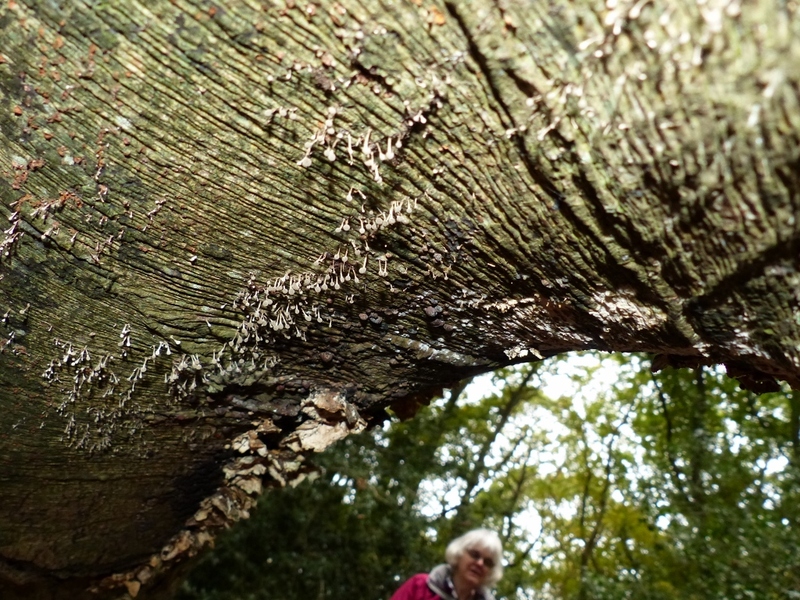 One intriguing fungus was found growing prolifically on the underside of a huge fallen beech tree. It was difficult to see without being collected. 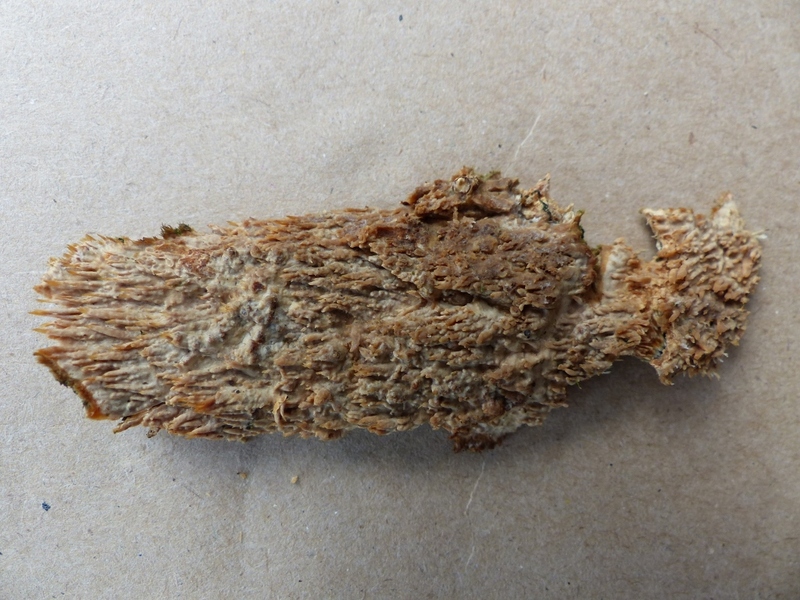 This was the Fenugreek Stalkball, Phleogena faginea, a strange Basidiomycete with a distinctive smell of fenugreek. 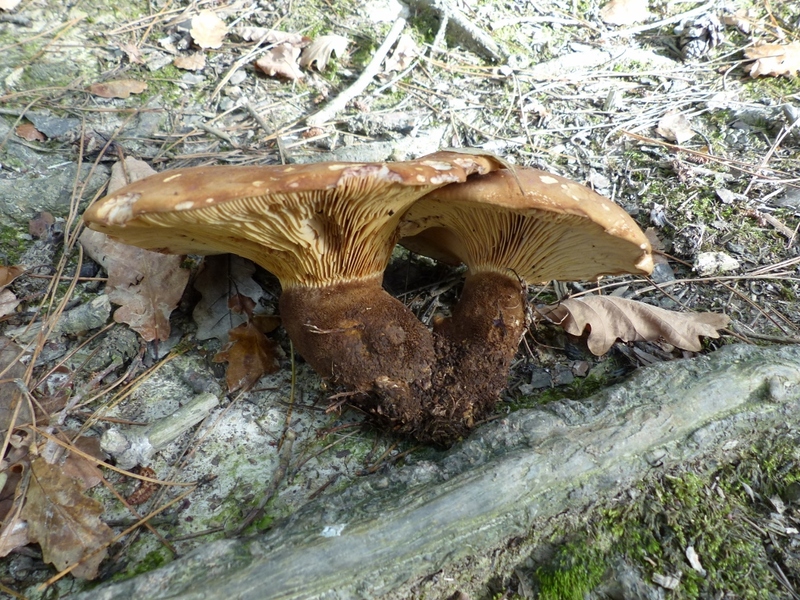 It is one of a suite of saprotrophs associated with old, mycologically rich beechwood. 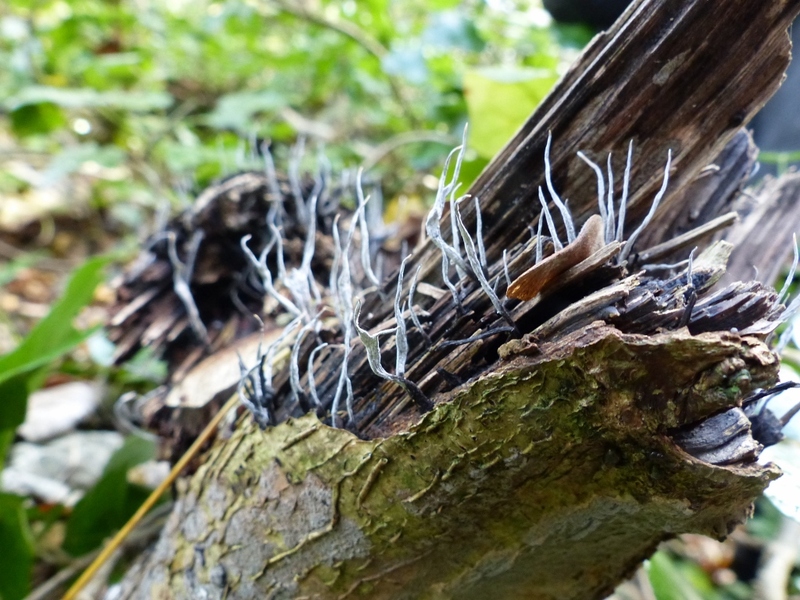 It was growing with three black crusts, Annulohypoxylon cohaerens (another indicator species), and the much commoner Hypoxylon fragiforme, Kretzchmaria deusta and Bjerkanda adusta. 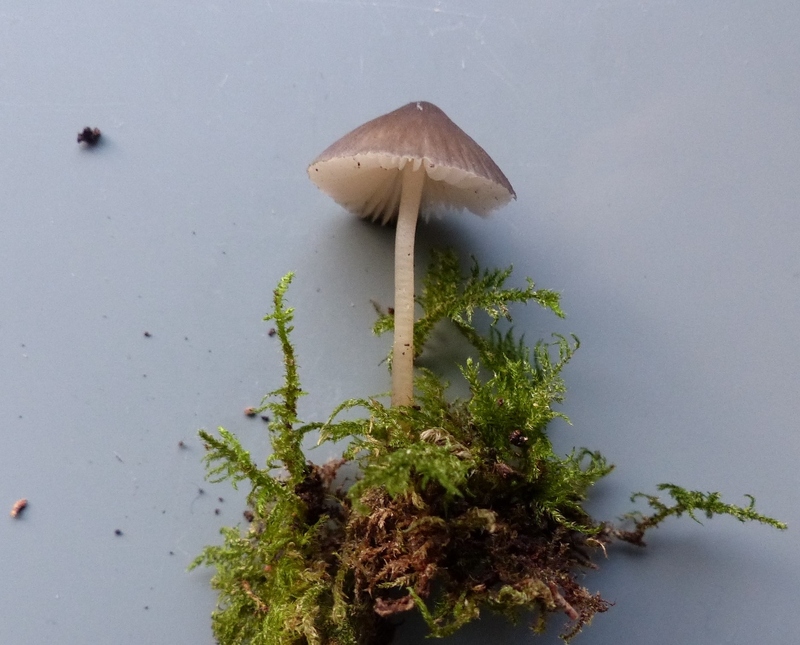 The following species were recorded (in addition to those above): Amanita citrina (False deathcap); Amanita phalloides (Deathcap); Amillaria gallica (Bulbous Honey Fungus); Armillaria mellea (Honey Fungus); Ascocoryne sarcoides (Purple Jellydisc); Cercosora depazeoides; Clithocybe gibba (Common Funnel); Clitocybe nebularis (Clouded Agaric); Collybia butyracea (Buttercup); Collybia dryophila (Russet Toughshank); Collybia erythropus (Redleg Toughshank); Collybia fusipes (Spindleshank); Coprinopsis picacea (Magpie Inkcap); Cortinariu s sanguineus (Blood Red Webcap); Cortinarius semisanguineus (Surprise Webcap); Erisyphe alphitoides (Oak mildew); Erysiphe urticae: Ganoderma australe (Southern Bracket); Hypholoma fasciculare (Sulphur Tuft); Laccaria amethystina (Amethyst Deceiver), Laccaria laccata (The Deceiver); Laccaria tortilis (Twisted Deceiver); Lactarius quietus (Oakbug Milkcap); Lactarius subdulcis (Mild Milkcap); Lepista flaccida (Tawny Funnel); Lepista nuda (Wood Blewit); Macrolepiota rhacodes (Shaggy Parasol); Mycena galericulata (Common Bonnet); Mycena inclinata (Clustered Bonnet); Mycena polygramma (Grooved Bonnet); Mycena vitilis (Snapping Bonnet); Oudemansiella radicata (Rooting Shank); Paxillus involutus (Brown Rollrim); Phallus impudicus (Stinkhorn); Phellinus ferruginosus (Rusty Porecrust); Phragmidium violaceum (Violet Bramble Rust); Phyllactinia fraxini; Pluteus cervinus (Deer Shield); Psathyrella piluliformis (Common Stump Brittlestem); Puccinia arenariae; Ramularia scrophulariae; Rhopographis filicinus; Russula nobilis (Beechwood Sickener); Russula ochroleuca (Ochre Brittlegill); Schizopora paradoxa (Split Porecrust); Scleroderma areolatum (Leopard Earthball); Scleroderma citrinum (Common Earthball); Stereum hirsutum (Hairy Curtain Crust); Trametes versicolor (Turkeytails); Tricholoma ustale (Burnt Knight); Trochila ilicina; Tubaria furfuracea (Scurfy Twiglet); Ceratiomyxa fruticulosa (a slime mould). It was a bright sunny morning for our foray but because this had been preceded by two weeks of dry weather, we were not optimistic for finding fungi. 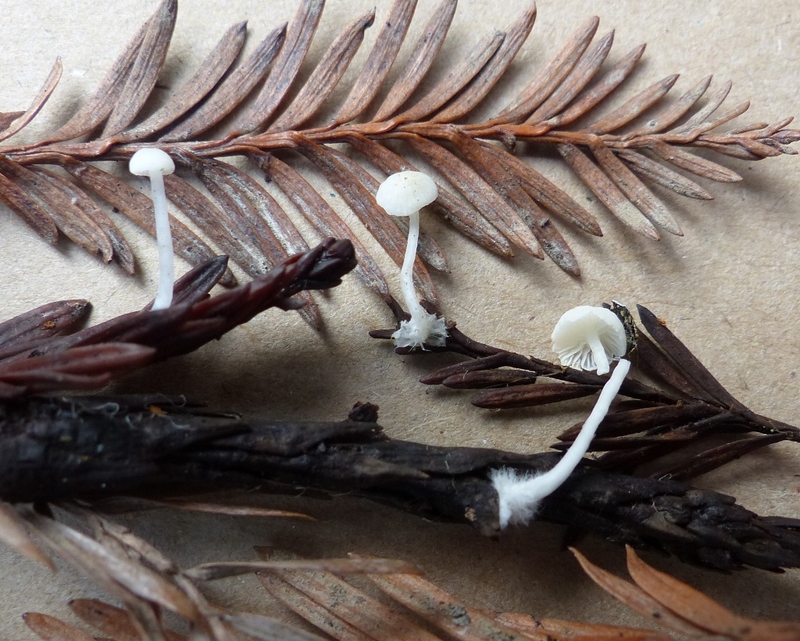 However, this proved to be wrong and we identified 42 species of macrofungi. We first visited an area to the east of the car park where we found Horns of Plenty (Craterellus cornucopiodes) growing with Trumpet Chanterelles (Cantharellus tubaeformis) and a good selection of other species. We spent some time puzzling over what looked like a species of Pholiota. 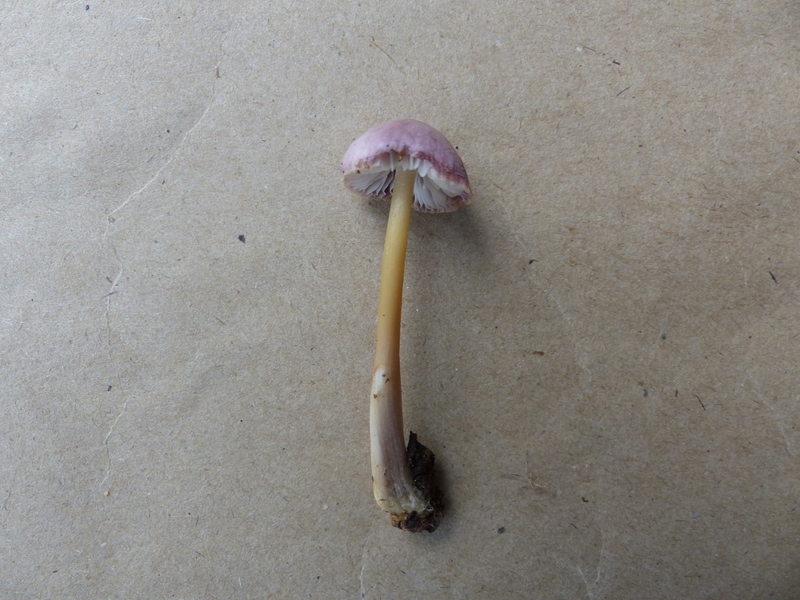 These were large, golden fungi but growing singly in a ring; they subsequently proved to be a Webcap (Cortinarius) species, a large and quite variable group. We then proceeded down towards the creek, where we pleased to see that the rare tooth fungi were showing well. There were a few Zoned Tooth (Hydnellum concrescens) together with a splendid show of Black Tooths (Phellodon niger) including some young groups which were still developing. An interesting large fungus which we do not see regularly was Velvet Rollrim (Tapinella/ Paxillus atromentosa) which is almost bracket-like with a conspicuous brown, velvety stipe. It is restricted to conifer woodland and found at the base of rotting stumps. The following species were recorded: Amanita excelsa var spissa (Grey spotted Amanita), Armillaria gallica (Bulbous Honey Fungus), Boletus badius, Cantharellus tubaeformis, Calocera cornea (Small Stagshorn), Calocera viscosa (Yellow Stagshorn), Chlorociboria aeruginascens (Green Elfcap), Clavulina rugosa (Wrinkled Club), Clitocybe nebularis (Clouded Agaric), Collybia dryophila (Russet Toughshank), Coprinus comatus (Shaggy Inkcap), Coprinus plicatus (Pleated Inkcap), Craterellus cornucopiodes, Hemimycena tortuosa, Hydnellum concrescens, Hydnum repandum (Wood Hedgehog), Hypholoma fasciculare (Sulphur Tuft), Laccaria amethystina (Amethyst Deceiver), Laccaria laccata (The Deceiver), Lactarius glyciosmus (Coconut Milkcap), Lactarius quietus (Oakbug Milkcap), Marasmius setosus, Mycena rosea, Mycena vitilis, Paxillus (Tapinella) atromentosus, Phellodon niger, Pholiota gummosa (Sticky Scalycap), Postia stiptica, Ramaria stricta (Upright Coral), Russula fragilis, Russula nigricans, Russula ochroleuca, Schizopora paradoxa (Split Porecrust), Steccherinum ochraceum, Stereum hirsutum, Thelophora pencillata, Trametes versicolor (Turkeytails), Tricholoma sejunctum (Deceiving Knight), Tricholomopsis rutilans (Plums and Custard), Erysiphe alphitoides (Powdery mildew on oak). It was a glorious sunny morning for our first foray of the season and, following a spell of prolonged wet weather in the previous month, expectations were high for a productive meeting. 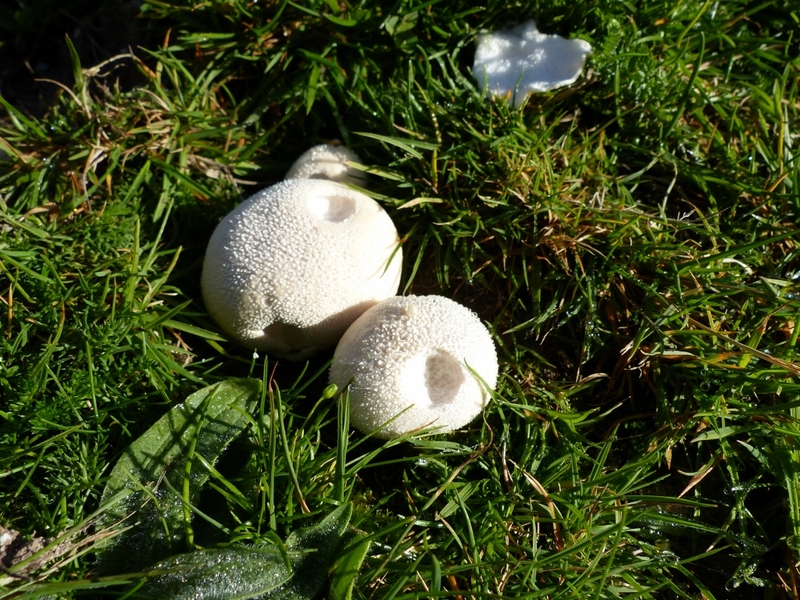 Our first find of the season was a group of Meadow Puffballs (Vascellum pratense) and this was soon followed by a selection of other grassland fungi, including several types of waxcaps and enough field mushrooms to allow a small collection for the pot. 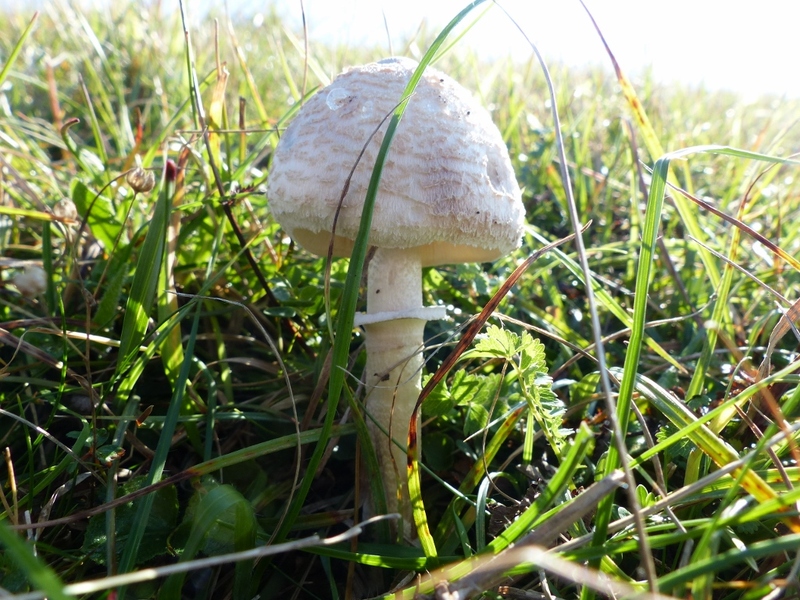 One of the larger toadstool type fungi we found was the Slender Parasol (Macrolepiota mastoidea). 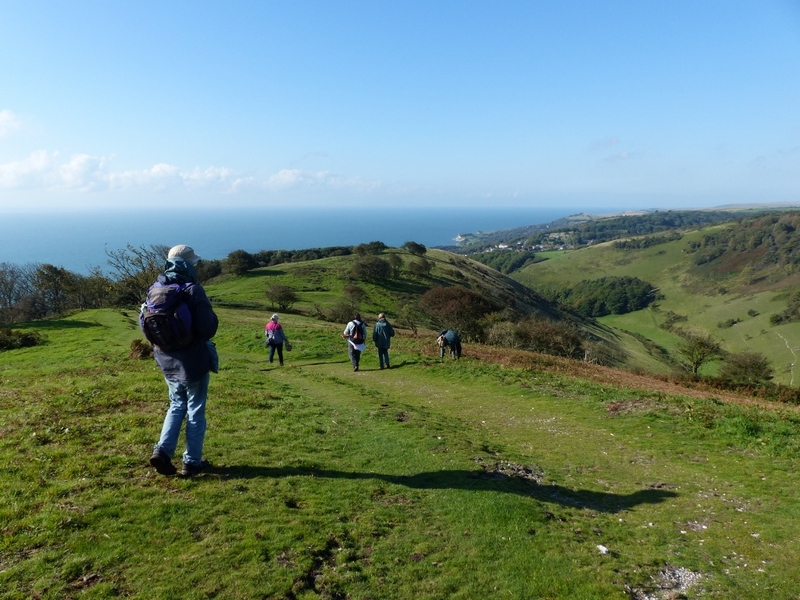 However, when we descended to the chalky slopes of St Boniface Down, we were disappointed by the lack of larger fungi, Amanitas and Boletes, which we had hoped to find. We found just one, rather slug-eaten specimen of Amanita ovoidea, the rare species associated with holm oak which has its national headquarters here. 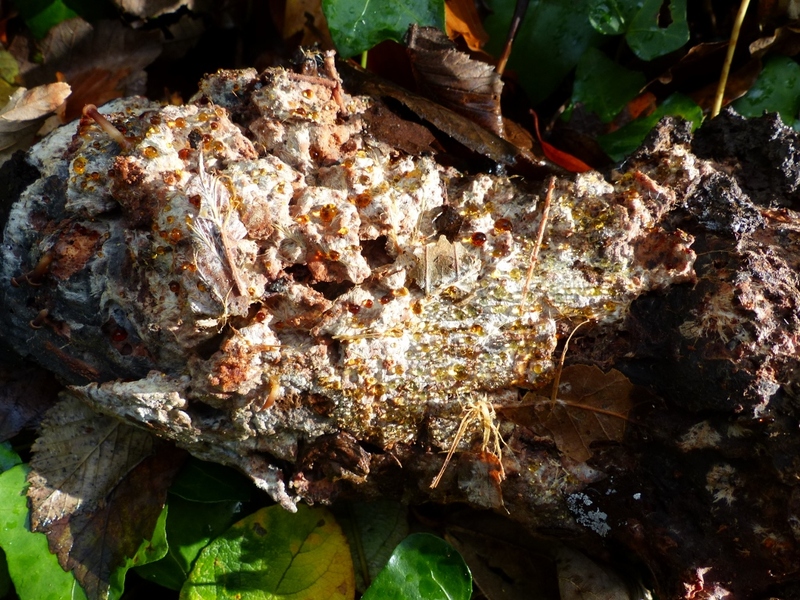 It would seem that a more prolonged period of wet weather will be required before these fungi, associated with holm oak and rock rose show themselves.